FREQUENTLY ASKED QUESTIONS: What is Pay-Per-Call? Optimal efficiency can be achieved by performance marketers who are quite familiar with ways by which online leads and sales can be improved digitally with the least possible cost, although a good proportion of them seems to have neglected phone call which happens to be a very good source of income. As pay per call offers both online and offline services, it may seem difficult to operate depending on the platforms employed. Right pay per call platforms encourage advertisers, publishers and agencies to keep record of calls, as they do with online traffics. If the objectives of pay per call still seem unclear to you, here are some answers to the frequently asked questions for you to start. Pay per call is a platform whereby publishers are paid by advertisers to produce, in place of the advertisers, quality calls. In other words, pay per call operates in the same way as performance networks, only that, pay per call tracks calls while performance networks keep track of clicks. Marketing campaigns are produced by advertisers as a means of introducing likely customers to phone connection. This is then followed by the launching of the campaign by a publisher who eventually gets all the merit for the calls generated. What are the benefits for advertisers? With the help of a publisher, advertisers, with less effort, get to widen their distribution and inbound call quantity through several channels. Besides, they are entitled to having an oversight function as well as the direction of car traffic and the experience of clients. When working with new publishers, maintaining of brand integrity and ensuring optimal customer experience is key. That very vital control needed by a brand to ascertain the effectiveness of new pay per call campaigns and publishers with little risk, is what Pay per call gives a brand. What verticals perform well for pay per call? Verticals like Industries that focus on lead age including EDU, home services, insurance, travel, legal service and financial service are advised to use pay per call. Also, products that are in great consideration that clients demand a human touch during the course of the purchase also perform well. Also, products of any sorts at the retails level whose worth is averagely $400 are also good for pay per call. What are the advantages for publishers? Pay per call offers publishers the opportunity to get more money than what they usually get without having to necessarily change their business models. Pay per call does not bring about restrictions, it is an incorporation of both clicks and calls. It offers the chance to do online transactions as well as phone traffic while maintaining the current channels as well as the advertisement model. The tracking and analytic ability used by publishers for call traffic as well as online traffic will not be altered for call traffic. Besides, they are able to access new quality promotions that come with greater charges. What are the best marketing channels and tactics for pay per call? 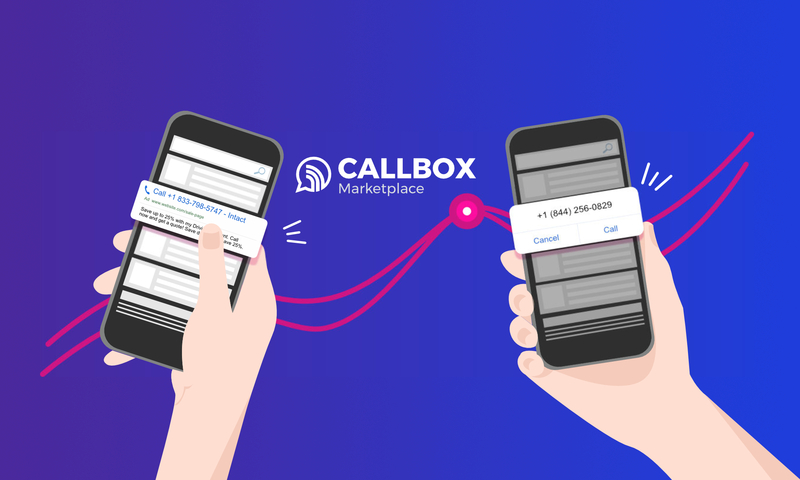 At Callbox Marketplace, we plan for the possibility of the success of advertisers and publishers via paid/mobile search, display advertising, search engine optimization (SEO), email, print advertising and radio this is what makes Pay per call campaigns productive both online as well as in traditional marketing tactics. Calls are tracked to their source? How? Unique tracking phone number – Assigned to a particular publisher or campaign is a unique phone number which tracks a customer’s call whenever the customer calls using that phone number. I want a call to qualify for a commission. What can I do? This is totally at the discretion of the Advertisers. More often than not, things like the duration of the phone call as well as some other details such as the time as well as date without leaving out the location or even the result of the call in such a case where it brings about a boost to sales as well as other variations of conversion can strengthen that resolve. Never forget that repeat calls or unanswered calls do not qualify to get a commission in any sense. Is it possible for calls to be filtered? Filtering calls is no big deal at all but it depends on fine details such as the date and time of call, region of the caller, type of phone as well as whether the caller is new or repeated. Customers’ responses to questions as well as phone prompts via the interactive voice response (IVR) is also utilized at Callbox to filter calls. The advertiser can decide to modify the volume of calls that should be commissioned. This aids the selection process whereby high quality calls get commission. I will like to route a call to multiple destination phone numbers or locations. Is that possible? The answer to that question is in the affirmative. Features that makes it possible for you to set up rules to route calls to your preferred destination is available at Callbox. A publisher can for instance run a car insurance campaign that is without a brand in order to be able to drive calls to multiple car insurance advertisers. Time of call, region of the caller as well as their answer to specific questions can be used to route their calls by the advertiser to their preferred destination. The effect of this is that the customer experience will be more worthwhile and the publisher will be able to optimize the number of calls they can offer commission. Advertisers with many stores or locations can also enjoy this feature. What is the experience like for people that call a business through a pay per call campaign like? There is really not much of a difference between the experience of customers making a call through a pay per call program and those making a business call directly. The routing as well as filtering regulations in place is what determines calls that will be will be connected to the advertiser as they ought to. In the event that an IVR has been set up, the IVR prompts will first be navigated by clients same way they do for the normal phone menu system. It will be exactly the same in the view of the customer. I want to start. What can I do? Various options are available to get started. The technology that powers pay per call programs is made available by Callbox for the leading performance networks. Advertisers and publishers who are already enlisted on the payroll of a network will have to contact the network in order to find out if they have an already existing set up for a pay per call program. Technology vendors CAKE and Tune by HasOffers are our partners at Callbox and we can also access technology integrations with CRM as well as marketing automation and analytics solutions to the end that you can add Callbox’s pay per call platform to your marketing mix without any form of complications. It is in our intention that these FAQs offer you a more vivid understanding of what pay per call marketing is all about. Pay per call is simply the next logical step for people who are not strangers to performance marketing.